Make sure that Keyman for macOS is the active input source (as shown above). 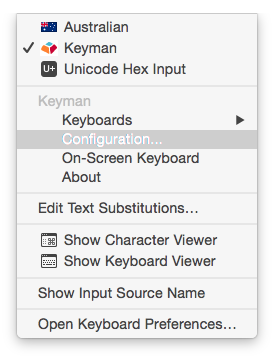 For more information, see Getting Started with Keyman for macOS. Click the Keyman icon to display the Input menu. On the Input menu, in the section for Keyman, click Configuration. Note: If you just installed Keyman and the Configuration menu is not available, please restart the computer. To disable a Keyman keyboard, untick the corresponding checkbox. To enable a disabled keyboard, tick the checkbox. Removing a Keyman keyboard package uninstalls and deletes the entire package. Although you can disable individual keyboards (as described above), if an installed package contains more than one keyboard, you cannot remove them individually. To remove a keyboard package, click the delete button in the far right of the row with the package name. 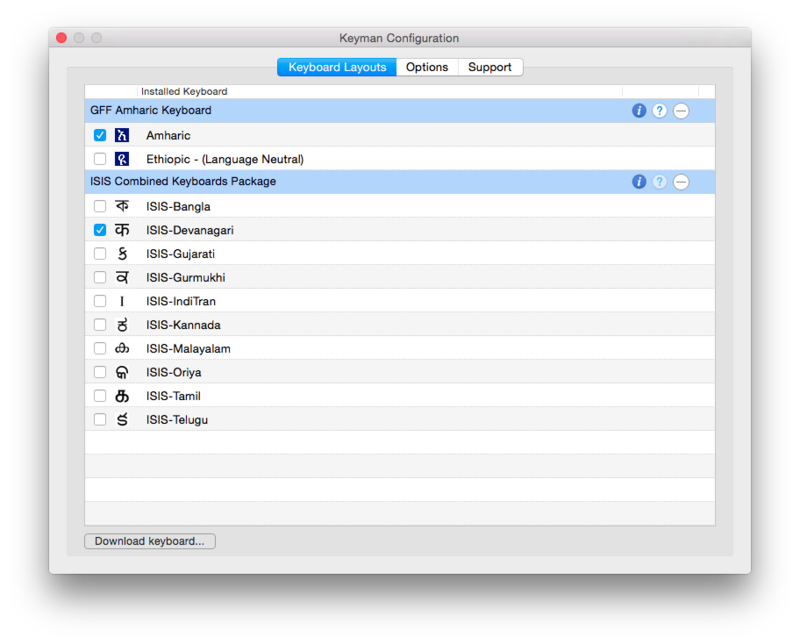 All Keyman keyboard packages contain some basic metadata information, such as the name and version, included fonts, author, and copyright. To display this information, click the information button to the right of the package name. Always show on-screen keyboard: If this option is ticked, the on-screen keyboard will be displayed automatically whenever Keyman becomes the active input source. Use verbose Console logging: If this option is ticked, advanced troubleshooting information will be sent to the system log. If the Keyman development team is assisting you to resolve a problem, they might instruct you to enable this option so you can supply them with a log of important debugging messages from Keyman. You can view this log information yourself using the Console utility, by filtering to show only messages from the Keyman process (although it probably won't be very meaningful to you unless you are a computer programmer and you are looking at the Keyman for macOS source code). Console is a log viewer developed by Apple Inc. and included with macOS. The Support tab on the Keyman Configuration window displays the same program help information available on-line at help.keyman.com/products/mac.